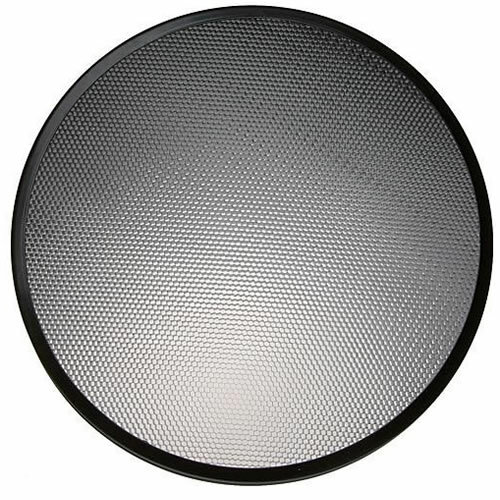 This honeycomb grid provides a beam spread of 35° when mounted to a Speedotron 22" beauty dish reflector. Grids are essential accessories for any lighting system. These devices alter the shape and intensity of the light output from your flash heads. Consider them as a painter would a brush, or a sculptor would a knife, or chisel. Use of a grid will result in a small circle of light, when it is attached to the front of your light source. The size of the circle of light will be determined by the density of the honeycomb, its thickness, and the distance of the subject. Essential Accessories for any Lighting System. Grids Change the Shape and Intensity of the Light Output from your Light. Uses include Hair or Background Lighting and Product Highlighting.